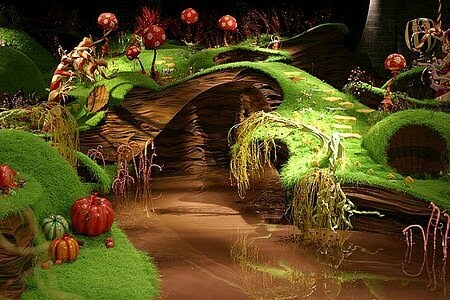 Willy Wonka's chocolate factory - How fantastic would it be if Willy Wonka's chocolate factory were an actual place. That you could go and visit and get lost in. I would happily go there and never return. Especially with the Oompa-Loompas and that chocolate river. Lyra's Oxford - I absolutely adore His Dark Materials by Philip Pullman. I love Lyra and this wonderful cast of characters, but one of my favourite things about Northern Lights, was his re-imagining of Oxford into this weirdly wonderful fantasy place, filled with daemons. It's always in the back of my head, 'if I lived there, what would my daemon look like?' Does anyone else ever wonder such things? 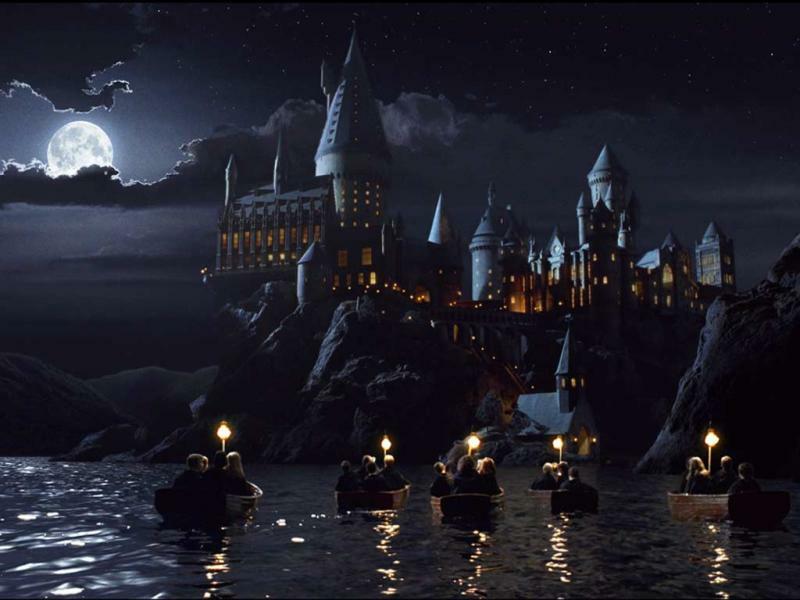 Hogwarts - Wouldn't everyone include Hogwarts on their list? I'm re-reading Harry Potter and the Half-Blood Prince at the moment, and hoping to carry on soon after with Deathly Hallows, and I'm absolutely positive that if this place existed, I would be beside myself with excitement. 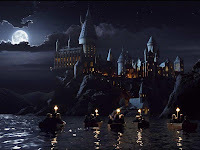 Obviously the movies brought Hogwarts to life, and as I love the movies, Hogwarts pretty much looks like it does on the screen. That's not neccessarily a bad thing, is it? Also, I'm pretty sure that I'd be a Gryffindor. Or maybe I just think I'd be in Gryffindor because I want to be in Gryffindor? I can't tell. Old Kingdom - Another one of my favourite series ever is the Old Kingdom trilogy by Garth Nix. I loved the Old Kingdom, with Free Magic and Charter Magic and Moggett and the necromancer bells and the awesome characters, and the different gates of Death. Oh, just everything about it = love. 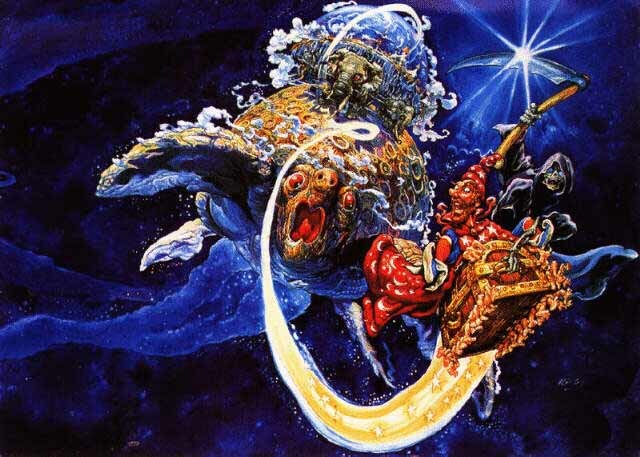 Discworld - I admit that I am a complete novice when it comes to Discworld! I've only read two adult Discworld novels and only read of the young Discworld novels: the first Tiffany Aching and Amazing Maurice and His Educated Rodents. But I think Terry Pratchett has a wonderful imagination and living in Discworld would be the closest thing to living in Terry Pratchett's mind. I think that would be truly awesome! And I know for sure that I won't stop reading Discworld for a very a long time. I have so much to catch up on! Neverland - Ooh, Neverland. With Peter Pan and the Lost Boys. Always on some adventure and flying. Fighting with Captain Hook. I could live with that. Oz - How much do I love Oz?! I'd love to count the ways with you, but this post would be never-ending. 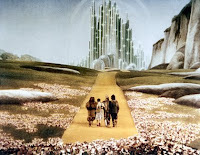 I'm a little ashamed to admit that I've only ever read The Wonderful Wizard of Oz, L Frank Baum's first book in the series on Oz. I do have the other in e-book format and will soon be getting to them. Most of my love for the place stems from the movie version. With Judy Garland and all the singing. It makes me happy. Camelot - Is anyone else watching Merlin? I love that show. It can be a little bit silly, but I will watch it until forever. I love the magic of the show and this great relationship between Arthur and Merlin. And I love the legend of King Arthur. And his knights. And the dragons. I can't stay that I've read widely of Camelot and all its goings-on, but it's still one of my favourite fictional fantasy places! Hundred Acre Wood - We've just started reading Winnie-the-Pooh with the boys. 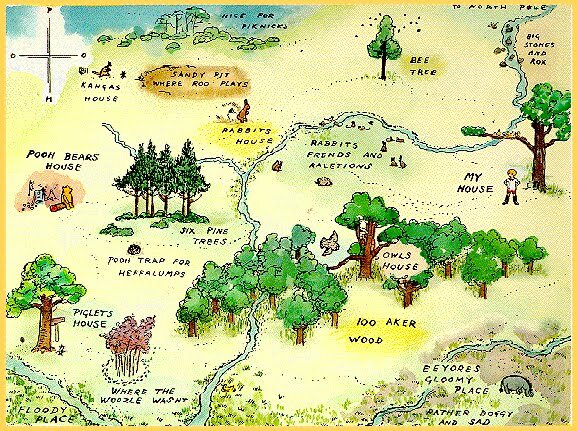 And I would love to live in the Hundred Acre Wood. How fun would that be? Playing Pooh-sticks and hanging out with Eeyore and Christopher Robin and everybody? Sigh. Runners-up: Otori and Middle Earth. 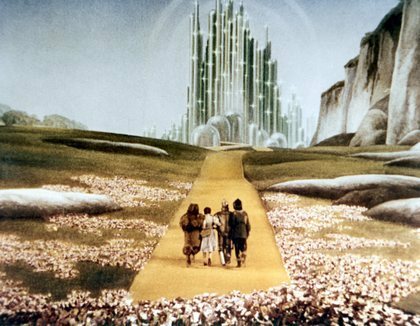 Which are your favourite fictional fantasy places? Definitely Hogwarts and Willy Wonka's factory. I also love Cassandra Clare's version of New York and London. Hogwarts, of course...probably also the HDM world, and the world of The Phantom Tollbooth - I'm not sure if that would be classified as "fantasy," though. As soon as I saw the title of this post I thought "Old Kingdom" so I am so pleased that you've included it! Really, I just want my own Mogget. Hogwarts is a given and I would also include Camp Half-Blood from the Percy Jackson series. Did you know that you can actually visit the Hundred Acre Wood. Ashdown Forest is believed to be where the story is set and there is a Winnie the Pooh shop and everything there. You can go and play Pooh sticks. Your boys would love it. awesome post - I wanted to be peter pan when I was little! Can you imagine getting the opportunity to walk through Willy Wonka's chocolate factory? Hogwarts would definitely make my list. Such a magical and interesting place. Not to mention all the interesting people you'd meet! And of course I'd have to stop in the Hundred Acre Wood. I can't not visit my friend Winni-the-Pooh. Zara - of course Hogwarts! The world of The Phantom Tollbooth? I'm not sure that I'm familiar with that..
Jenny - HA. I always fantasised about boarding school as well. Until HP. Not I fantastise about Hogwarts and nothing else..
Splendibird - YAY we're on the same page with the Old Kingdom. I'd like a Mogget as well. And I've not read the Percy Jackson books, would you recommend them? Kirsty - me too. me too. Luisa - Thank you :) I think the chocolate really speaks for itself. Literary Feline - It would be AMAZING to be able to visit a real life Willy Wonka's Chocolate Factory. I'm glad that everyone seemed to enjoy this post! It took me several weeks to write it.